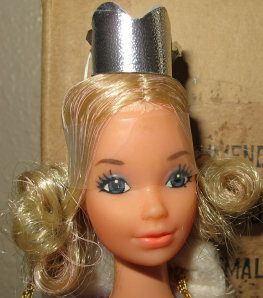 Miss America was introduced in 1972. She came in two versions; #3200 Walk Lively (1972-1973) with burnette hair and #8697 Quick Curl (1973-1976) with blonde or the harder to find brunette hair. Both had the Steffie Head Mold. She was only available by mail in the later part of 1973. 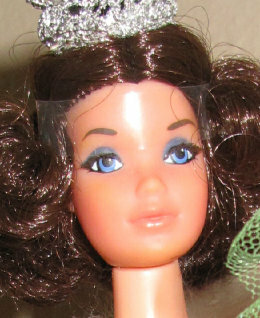 There was also a Kellogg's Exclusive #3194-9991 Miss America Walk Lively in 1972. Miss America had three hard to find outfits which were made for her all in 1972 (see below). Here is the back of the Corn Flakes Box which had the promotion for the Miss America Walk Lively Doll #3194-9991. 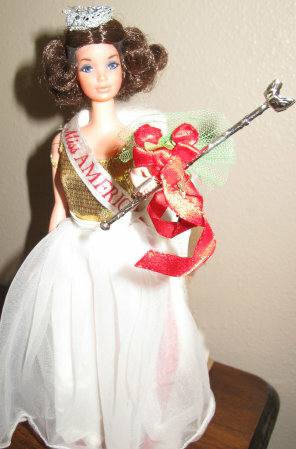 Also shown is Laurie Lea Schaefer Miss America 1972 promoting the doll. Be sure to follow my blog too! Miss America with the hard to find brunette hair color.